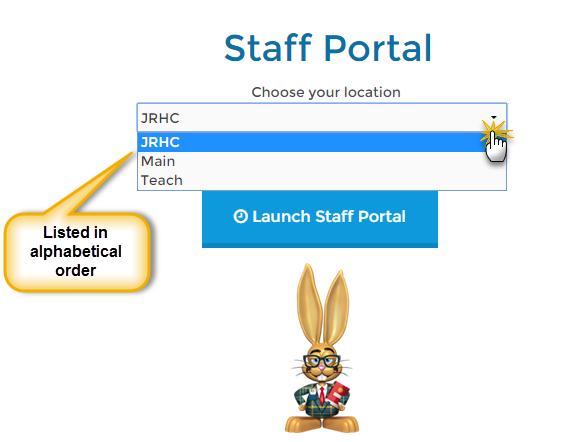 When you have more than one Jackrabbit Location in your database there is an additional step required when you are launching the Staff Portal. The Staff Portal must be launched for each Location separately; you cannot launch the portal for all Locations simultaneously. A drop-down list allows you to select which Location to launch the Staff Portal for. This is an alphabetical listing of the Location Codes (not Location Names) in your database. Note: There is no way to change the ordering from alphabetical. Once the portal is launched your staff are able to log in. When launching the Staff Portal remotely you can add &Loc=location code (where location code is the code of the preferred Location) to the remote launch URL to automatically launch the portal for the specified Location. Example: https://app.jackrabbitclass.com/jr3.0/TimeClock/StaffLogin?orgId=522358&Loc=Main.